In recent years, pro-abortion politicians in a number of states have targeted life-affirming pregnancy centers with harmful laws that violate their First Amendment rights. As alarming as this is, in Ohio, we’ve been blessed with quite a different story. Here in Ohio, our legislature is overwhelmingly pro-life—so pro-life, in fact, that in the last 7 years, Ohio Right to Life has seen 19 pro-life initiatives signed into law! Relevant to the work of pregnancy help centers, this summer, Governor John Kasich approved $1 million for Ohio Right to Life’s Parenting and Pregnancy Support Program, an initiative we formed in 2013 to provide state funds to life-affirming pregnancy centers. In years past, there has been a lot of confusion about the application process. The truth is, the application process is rather rigorous and requires careful planning and writing to guarantee consideration. But as intimidating as that may sound, there are plenty of fantastic resources right here in Ohio that can help you as you set out to apply for these funds. The goal of our training is to connect you to these resources, answer your questions, and set you up for success in your efforts to secure funding for your life-saving efforts! If you are interested in attending this event, kindly RSVP to me, Jessica Koehler, at 614.547.0099 ext. 303 by Wednesday, September 6. In Ohio, we are so grateful to have a legislature and governor who care about supporting alternatives to abortion. 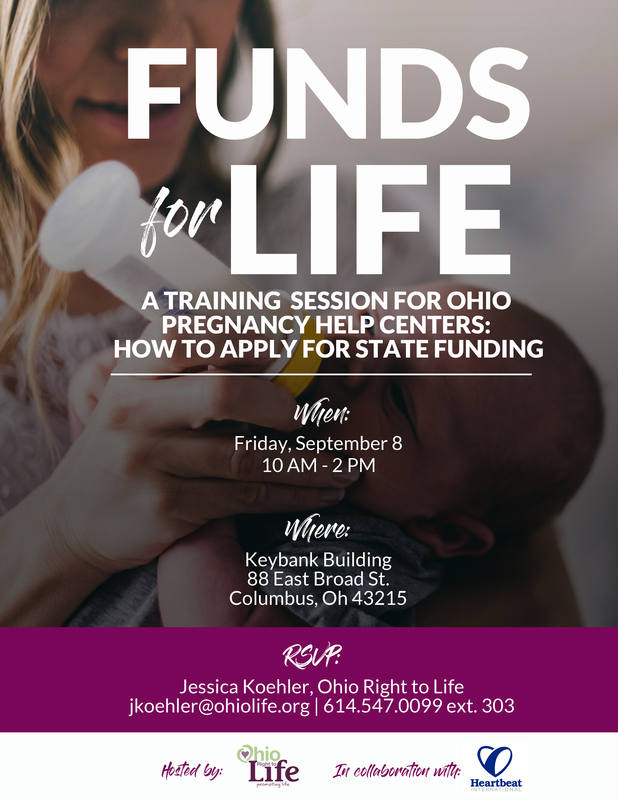 Ohio Right to Life is eager to help your center apply for these funds and take advantage of this opportunity to grow, change hearts, and save lives. Please don’t hesitate to contact me if you have any questions about our upcoming training or the Parenting and Pregnancy Support Program generally. Every day, more than 3,000 children are killed through abortion and their bodies discarded as medical waste. It’s time to honor their lives and give them the dignity that the tragedy of abortion denied them. 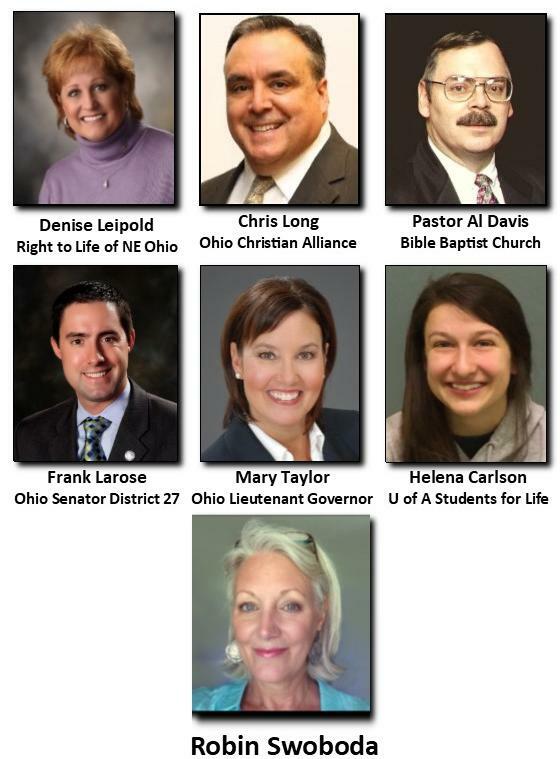 Join Right to Life of Northeast Ohio as we sponsor an interfaith memorial service on the fifth annual National Day of Remembrance for Aborted Children,calling on pro-life Americans to honor the grave sites and memorials of our aborted brothers and sisters. Please, can you spare just one hour and join is in a memorial service at 1PM to be held near the Memorial to the Unborn at Holy Cross Cemetery in Akron? With the accompaniment of the Knights of Columbus Color Guard, memorial service participants to date include Pastor Al Davis (Bible Baptist Church, Richfield), Chris Long (President, Ohio Christian Alliance), Senator Frank Larose (Ohio Senate District 27), Ohio Lieutenant Governor Mary Taylor, Helena Carlson (President, University of Akron Students for Life) and keynote speaker Robin Swoboda. A full map of the cemetery with the location of the memorial service is available on our website by clicking here. The memorial service will be held rain or shine. You are welcome to bring a chair with you. Parking is along the side of the cemetery roadway near the memorial. Please let us know you are coming by clicking on the link below so that we print enough programs. Please help us to honor the innocent lives of the children who were killed before birth, and were also denied the dignity of a funeral. Below is our weekly media and travel schedule, but first let me give you some important updates. Please join us for a Father’s Day Novena taking place now until June 18, found at www.PrayerCampaign.org/FathersDay. Be sure to sign up and let us know you are participating. We are looking for individuals who consider themselves to be “pro-choice” to complete a survey we have created which measures people’s opinions on late term abortion. You can find it at AbortionSurvey.org. Please help us spread this on social media. Finally, please spread the word about job opportunities at Priests for Life in our new Titusville, FL location. See PriestsForLife.org/jobs. Hear us on EWTN radio on Catholic Connection with Teresa Tomeo. Fr. Frank will be on with Teresa on Friday, June 16 at 8:35 am. Call-in to the live show with questions at 877-573-7825. For more information and to listen to the live show on the internet, go to http://www.avemariaradio.net/hosts/teresa-tomeo/. Father Frank Pavone will be on March 4 Life NY Radio at 7 p.m. ET June 12. To listen, go to www.blogtalkradio.com/march4lifeny-radio. Alveda King will discuss the unborn and the 14th amendment on the CL Bryant Show at 7:06 p.m. ET June 12. Listen online at www.theclbryantshow.com. Janet Morana will be the host of EWTN Radio’s Open Line on Tuesday, June 13, from 3 to 4 p.m. ET. Callers with questions or comments about pro-life or chastity issues are invited to call 800-585-9396. Listen online at www.ewtn.com. Go to radiomaria.us to listen online. Airing: Tuesday, June 13 at 6 p.m. ET and rebroadcast on Thursday, June 15 at 2 a.m. ET and Monday, June 19 at midnight ET (11 p.m. CT Sunday). Topic: Dr. Mary Davenport will present new research in the abortion pill reversal process, and David Bangs will talk about counseling young women who want to save their babies this way. Airing: Wednesday, June 14 at 3 a.m. and Thursday, June 15 at 11 p.m. ET. You can also stream EWTN online by going to EWTN.com and clicking on the “television” tab. Topic: Sr. Margaret Mary discusses the preciousness of every life and how God makes all things possible. Airing: Wednesday, June 14 at 11 p.m. and Friday, June 16 at 10:30 a.m. You can also stream EWTN online by going to EWTN.com and clicking on the “television” tab. Topic: Timmerie Millington describes her home-schooling experience and how she managed to engage with the culture while remaining true to her Catholic faith. My team and I often write op-eds for various media outlets that are posted online. Below are just a few that have been written recently. A longer list can be seen at our Priests for Life online library. I invite you to read and comment on them. By doing so you can help to spread the pro-life message and counter any anti-life comments that others have submitted. Evangelist Alveda King will present at the BCS Leadership Initiative 2017 on Thursday, June 15th to Friday, June 16th, 2017. Fr. Frank and Bryan Kemper will be at the National Right to Life Convention in Milwaukee, WI, Wednesday, June 28th to Sunday, July 2nd, 2017. Fr. Frank will be presenting at the National right to Life Convention. Bryan Kemper will be at the exhibit area. Hyatt Regency, Milwaukee, 333 West Kilbourn Ave, Milwaukee, WI 53203. The following are the two sessions that Fr. Frank will be presenting. The Church, The Media, and The State – Reverend Frank Pavone, Ernest L. Ohlhoff, Steven Ertelt. See http://nrlconvention.com/ for more info and the complete schedule. *ANNUAL RIGHT TO LIFE GERANIUM SALE (weekend before Mother’s Day weekend): Thanks to everyone who purchased geraniums in 2017! This is our major fundraiser for the year so it’s very important that we have a successful sale! Thanks for helping us promote the sanctity of human life from conception til natural death! We wish to Thank everyone who purchased the LIFE geraniums! The weather was terrible the sale dates so it took a while to find homes for all of the flowers but thanks to God’s help we can take our signs down!! LIFE is God-given! Below is our April Fr. Frank Reports (Travelogue). This is a newer publication that is published on even months and provides a glimpse of what takes place as my team and I go out ‘on the road’ across America and around the world to defend the unborn and bring an end to abortion. This is the first time we are sending this via email. You can see past issues and also sign up to receive our Newsletter and Fr. Frank Reports via postal mail at www.PriestsForLife.org/newsletters/index.aspx. 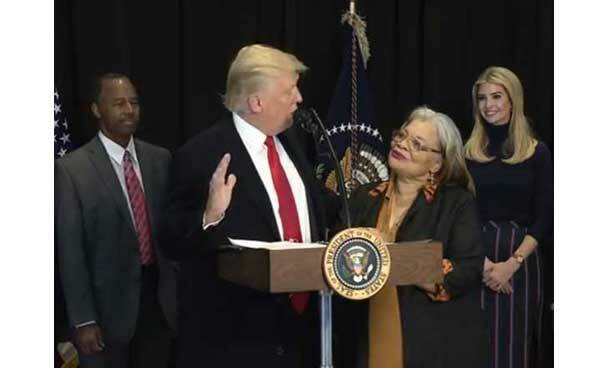 Alveda King was thrilled to accept the National Religious Broadcaster’s Chairman’s Award during Proclaim 17, the NRB convention in Orlando, Florida, at the end of February. Any time I can speak at a youth event I am excited, I love being able to inspire this generation to be the generation to abolish abortion. As part of my full-time work with Priests for Life, I attend conservative meetings when I am in Washington, D.C. Recently, I got notice that White House Counselor Kelleyanne Conway. Marie Smith, founder and director of Parliamentary Network for Critical Issues, an outreach of Priests for Life, represented Priests for Life at the United Nations from February 1-10. While helping to organize and promote the protests nationally, Priests for Life Pastoral Team members protested Planned Parenthood in three states and the District of Columbia on February 11. In early January, Fr. Denis Wilde, OSA, completed a four day parish mission at Holy Trinity Church, in Peachtree City, GA.
At Priests for Life we receive feedback every day thanking us for our work and telling us of its impact. See our entire April 2017 Fr. Frank Reports for more photos and complete text of articles.